When shopping for homes, don’t forget to think beyond the property line and factor in the neighborhood. As an Accredited Buyer’s Representative (ABR®), I can help you evaluate many different facets of both the home and the neighborhood to help you find the perfect place! Buying a home involves buying into an entire community. It’s important to make sure your new neighborhood suits your needs and preferences every bit as much as the house you decide to purchase. After all, most houses can be modified, but neighborhoods can’t. Your buyer’s rep will be able to assist you in many important aspects of your purchase, like locating suitable properties, negotiating, and executing essential transaction details. Along the way, they’ll be able to help answer your questions, with the exception of certain questions concerning neighborhoods. That’s because real estate professionals must abide by Fair Housing laws, which prohibit housing discrimination. Further, neighborhood preferences are highly subjective and personal. 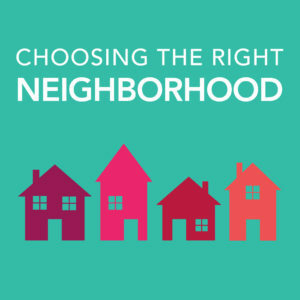 As a buyer, YOU need to decide if a neighborhood feels right for you. Your buyer’s reps can point you to excellent resources for background research, but it’s up to you to interpret that information. Library — Ask the person at the reference desk about the community. In addition to sharing his/her personal perspectives, they may be able to point you to additional valuable resources.